The Scottish Borders extend from the North Sea coast north of Berwick-upon-Tweed in the east, to Annanhead Hill, only a mile and a half from the M74 motorway, in the west. Travelling south to north it extends from near Canonbie to the spine of the Pentland Hills and to the North Sea at Cockburnspath. For accommodation in the area see the links in the "See and Stay" menu above. See the map below for an outline of the area and links to surrounding areas. 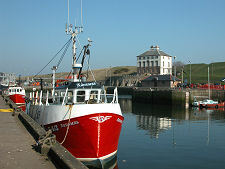 The first settlement on the coast north of the English border is Burnmouth, a village mostly hidden at the foot of the cliffs surrounding its harbour. 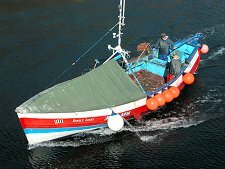 A few miles north is Eyemouth, a busy and attractive fishing port and seaside resort whose fortunes and tragic misfortunes have been closely linked to the sea since the 1200s. Inland from the North Sea Coast and the A1 lie the Lammermuir Hills, with the villages of Gifford to their north and Duns to their south. West of Berwick-upon-Tweed is Paxton House and the nearby Union Chain Bridge. while on the English side of the border is Norham Castle, where some key moments in Anglo-Scottish history were played out. Two miles east of Duns is Manderston, the epitome of the Edwardian country house, while a little further east again is the Norman Edrom Arch. Seven miles south of Duns is its long term rival for the title of county town of Berwickshire, Greenlaw. Just to the east of Greenlaw is the Richard Hillary Memorial, while to the south is Hume Castle. North of Duns are a series of small village on the southern flank of the Lammermuirs. These include Longformacus and Abbey St Bathans, both on the route of the Southern Upland Way. Following the main A68 road from Darlington to Edinburgh you cross the border at Carter Bar and descend towards Jedburgh, Smaller and more traditional in feel than Hawick, Jedburgh is overshadowed by the remarkably complete remains of Jedburgh Abbey, just to the south of the attractive centre of the town. Of the castle that once played such a central part in repeated Anglo-Scottish wars, nothing now remains, though the Victorians did build the Castle Jail on the site. North of Jedburgh the A68 passes through St Boswells. From here it is possible to follow minor roads that loop round to another of the great border abbeys, Dryburgh Abbey. To its north is the William Wallace Statue and the magnificent Scott's View. 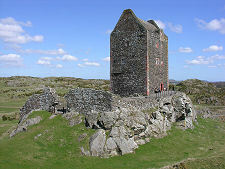 A couple of miles further to the north east is Smailholm Tower. There is a fine church with Norman origins, Smailholm Church, in the nearby village of Smailholm. A little north west of St Boswells is Newton St Boswells. Nearby is the fine old Bowden Kirk. East from St Boswells the A699 takes you to Kelso, which also grew up around its abbey. Kelso Abbey was once the most powerful and impressive of the four major border abbeys, but thanks to repeated invasions by Henry VIII during the "rough wooing" (see our Historical Timeline) it is the least well preserved of them today. On the edge of the Cheviots south east of Kelso lie the twin villages of Town Yetholm and Kirk Yetholm, the latter being best known as being the start or finish of the Pennine Way. Also close to the border south of Yetholm is the hamlet of Hownam. North of Hownam is the more substantial village of Morebattle, while two miles to the latter's west is the ruin of Cessford Castle. Like Kelso, Coldstream lies on the River Tweed as it makes its way to the sea at Berwick. 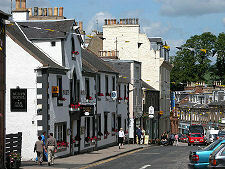 The town is best known for giving its name to a regiment of the British Army, the Coldstream Guards, formed in 1650. Coldstream lies just half the width of the River Tweed away from England and has had an eventful history as a result. 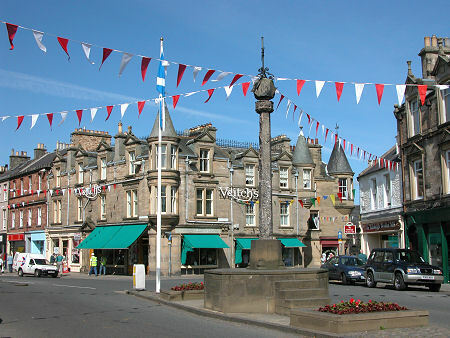 The main route through the western Scottish Borders is the A7, on which you find the important town of Hawick. This is home to the impressive Borders Distillery,	the first (legal) whisky distillery to operate in the Scottish Borders since 1837. In the remote upland countryside north west of Hawick are Ettrick and Ettrickbridge. North of Hawick lies Selkirk, on a tributary of the Tweed, the Ettrick Water. This was the site of a royal castle from the 1100s but remained a small village until 1791 when it began a century of dramatic growth with the building of woollen mills along the river valley. The woollen industry which was once so important to the Scottish Borders has declined. But parts of the industry still thrive. Lochcarron of Scotland relocated to Selkirk from Galashiels in 2006, and Andrew Elliot Ltd's Factory and Mill Shop is another excellent example of a working mill. Further west is the A708. Attractions along this little used road include the James Hogg Monument overlooking St Mary's Loch, and Tibbie Shiel's Inn. Yarrow Kirk in the tiny settlement of Yarrow has a very unusual plan, while the nearby Yarrow Stone is a very early Christian memorial with a Latin inscription. An alternative route through the area is provided by a minor road running close to the English border along Liddesdale to Newcastleton. This is an estate village built in 1793 for hand loom operators and the street pattern has changed little since. North from Newcastleton is the broodingly forbidding Hermitage Castle, in our view one of the two spookiest castles in Scotland (the other is rather more modern). Nearby is the Chapel of Hermitage. The attractive town of Peebles lies on the north bank of the Tweed. Its broad High Street leads to Peebles Old Parish Church, built in 1887 and incorporating parts of an older church. The ruins of a still earlier church, Cross Kirk, can be found on the western side of the town, while St Andrews' Tower, part of a parish church dating back to 1195, also still stands. Peebles is home to the excellent Tontine Hotel, while nearby is the John Buchan Story. West of Peebles, the River Tweed curves south above its confluence with the Lyne Water, passing Stobo Castle and Stobo Kirk on one side, and the Dawyck Botanic Garden on the other. The scattered settlement of Lyne, on the north side of the valley of the Lyne Water, is home to Lyne Church, and to the remains of a Roman fort and, at Abbey Knowe, a dark age Northumbrian cemetery. To the south is Tweeddale and some of the most remote countryside anywhere in Scotland. In the tiny hamlet of Tweedsmuir near the A701 is the very attractive Tweedsmuir Kirk. Ten miles north west of Peebles is the attractive village of West Linton with its unusually fine St Andrew's Church. Heading back towards Peebles you find the village of Eddleston. This is home to the Horseshoe Inn. Between Eddleston and Peebles is the outstanding Cringletie House Hotel. Meanwhile, a minor road to the south west passes close by White Meldon, home to an important hillfort, and to the remains of the hut circles of the Green Knowe Settlement. After leaving Peebles the Tweed passes Innerleithen, which grew in the 1700s around its mills. A short distance south of Innerleithen is Traquair House. 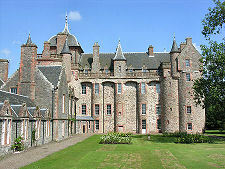 This started life as the Palace of Traquair, a favourite retreat of Scottish Kings as far back as 1107. Galashiels lies not on the River Tweed, but on the Gala Water. It grew as a mill town. Further up the Gala Water is the ancient village of Stow. If you travel east through Galashiels and past the confluence of the Gala Water with the Tweed you come to the very attractive town of Melrose: en route passing the home of Sir Walter Scott, Abbotsford. Melrose is perhaps best known for being the home since 1883 of a rugby tournament, the Melrose Sevens, held in April each year. 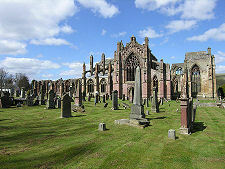 In the heart of the town lie the remains of Melrose Abbey, originally founded here by the Cistercians in the 1100s. Melrose was on the route of more than one marauding army from the south, and much of what remains dates back only to the 1400s. And quite a lot does remain, including a fair part of the Abbey Church, said to be the final resting place of Robert the Bruce's heart. Forming part of the abbey is the excellent Commendator's House Museum. 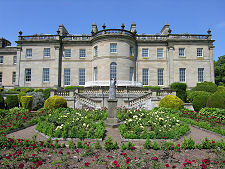 Melrose is also home to two National Trust for Scotland gardens, Harmony Garden and Priorwood Garden, and to the Trimontium Museum, celebrating the town's Roman heritage. 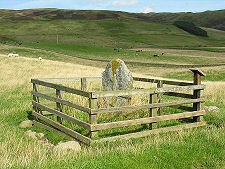 On the flank of the Eildon Hills south east of Melrose is the Rhymer's Stone. North along the A68 from Melrose is Earlston, with, beyond it, Lauder. 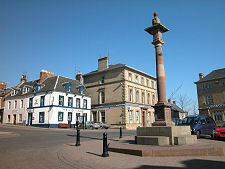 Lauder is a traditional market town which lies on the western side of the Lammermuir Hills, and is the departure point for the Southern Upland Way as it heads north east to traverse them. On the edge of Lauder is Thirlestane Castle, built to an unusual design in about 1590 and converted into a palace in the 1670s and a grand country house in the 1840s. Also in Lauder is its Old Church. Five miles north is the remote Channelkirk Church, while still further north is the fascinating Soutra Aisle. 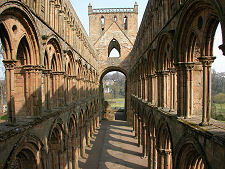 Driving Tours: Jedburgh Abbey, Melrose Abbey, Dryburgh Abbey and Kelso Abbey are visited on our Border Abbeys Driving Tour; while the west of the area is traversed on our Selkirk & Langholm Driving Tour.